Government on Tuesday opened 9th round of bidding for city gas distribution (CGD) licensing, in another 86 GAs (Geographical Areas) covering 174 districts. Speaking at the ninth CGD Bid Round here Petroleum Minister Dharmendra Pradhan said this is the largest ever round which covers 20 States and 2 Union Territories (UT) of the country. After this round, India will have CGD coverage in nearly 50 per cent of the total 640 districts in the country and about 50 per cent (61 crore) of the population of the country, a Petroleum Ministry release said. The last day for bidding is July 10. The Minister said, the bid process has been rationalized and investor-friendly parameters evolved to attract serious bidders, encourage competition and unreasonable parameters like amount of Bank Guarantee determining the winner have been removed. The round is likely to attract an investment of Rs 70,000 crore, a PNGRB presentation made at the event said. Pradhan said the government is targeting to raise share of natural gas in the primary energy basket to 15 per cent from current 6 per cent, in next few years. The bid round is also aimed at meeting Prime Minister Narendra Modi’s target of giving piped cooking gas connection to 1 crore households, roughly triple the current size, by 2020. CGD licences for Bhopal in Madhya Pradesh, Ahmednagar in Maharashtra, Ludhiana and Jalandhar in Punjab, Barmer, Alwar and Kota in Rajasthan, Coimbatore and Salem in Tamil Nadu, Allahabad, Faizabad, Amethi and Rai Bareli in Uttar Pradesh, Dehradun in Uttarakhand and Burdwan in West Bengal are on offer. In the new guidelines, maximum weightage of 50 per cent has been given to the number of piped gas connections proposed in eight years from the date of authorisation, as compared to 30 per cent earlier. 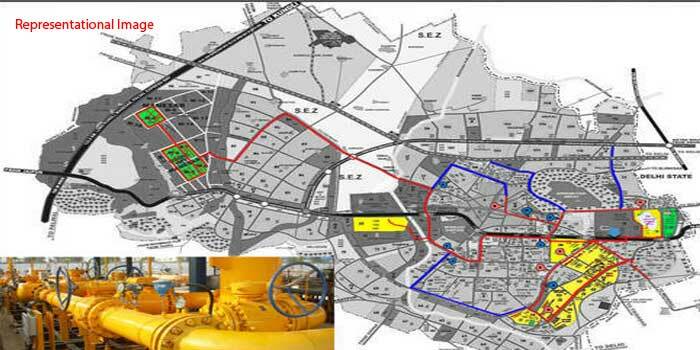 A Mini Gas Grid in North East connecting all state capitals being developed by a JV of 5 companies will cover 1,500 kms is also being developed. He said partnership with State Governments is needed and they should co-operate and support the CGD entities and the Ministry in making states pollution free. PNGRB Chairman D.K.Saraf in his presentation said that the current LNG Infrastructure is a bottleneck and needs to be stepped up from 26 MMTPA now to about 50 MMTPA by 2022.